Its no secret I’m not an Apple fanboi, more about their alledged theft of *nix code and theft of other peoples ideas and products (see the info graphic at the bottom). I’ve also been saying for a while since Steve Jobs passed, Apple has lost its creativity and innovation, no new products since this time kinda reinforced this opinion. All they have done is made them larger and thinner and much of the same-same. The recent lapse in updates from their portable market where they were effectively selling 3-4 yr old technology for modern day prices and other such shyster moves adds to the pile. However it appears Apple has been slowly been creating its new cash-cow in the background built on top of Jobs work. Much like a wolf in sheep clothing they disguised it as a feature and enhancement to make their products thinner and lighter with the promise of better products. It seems its been more about moving the fan bois and fan girls into kill box as it were. Sheep to the Slaughter. It seems the new product from Apple, is iDongle or rather iDongles. Currently none of the flagship products are able to communicate with each other, straight out of the box without a middleman. What happened exactly to “it just works” ?. I challenge you to link your new iPhone 7 to a Macbook without needing a middle-man to handle the exchange. Challenge #2, show me how you charge your Macbook, and connect to a printer ? Challenge #3, show me how you charge your iPhone and listen to music with your supplied earphones ? While everyone were getting their rocks off about how “shiny and slender” or “pretty and dainty” the new Apple products were because they removed this connector and that connector. All because those connectors were big and bulky, but it seems secretly Apple were positioning their new product line. 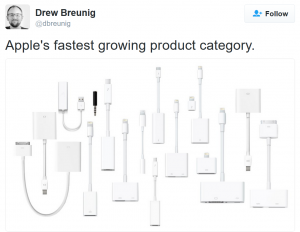 From Drew Breunig’s Twitter Post (image right), that’s a tonne of different connectors and dongles you need to make all your Apple products work together. Don’t forget there are Firewire, USB, USB-C, Lightening, New Lightening, Magsafe, VGA, HDMI, HDMI Mini, 3.5mm Jack, Micro USB and Mini USB off the top of my head, possibly other connectors too. Out of the 17, yes SEVENTEEN dongles that Apple has released, NONE of them make a common task like charger, printer and speakers all connected at once possible. The most you can connect is 2 devices, for more than that, you need to Daisy Chain them, and link 2 or 3 different dongles, and CHING CHING, you’re being milked by Apple like a good cash cow. Apple has recognised that even fan bois and fan girls are showing discontent, so they have reducing the price of cable bag you now need, some discounted 50% or more. This doesn’t change the fact you need carry a tonne of connectors, the fact many many people are losing the connectors but I guess it is a little less painful on the wallet… not much though. This has spawned a secondary market of new gadgets. When I say new gadgets I more mean a re-appropriation of an old DJ Gadget. One of my friends who is a DJ were ALWAYS losing his keys, so back in the late 1990s he made a keyring with a Headphone Jack, some speaker wire, a ring loop and a small carabena and stuck his keys into a spare jack point so he always knew where they were. 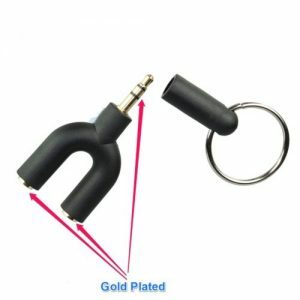 The same guy also had one of those whistler things on his keys so he could find them in the dark. He even had a sample whistle he used to play via the club speakers to light them up. I saw some years later a better constructed version of this, or a more highly polished remake. Back on track a company called Uncourage took this old method and created a keeper for your required 3.5mm speaker dongle, so you don’t lose it so easy or so often. I used to have one of those pictured, which includes the safety keeper and a splitter for a few quid.